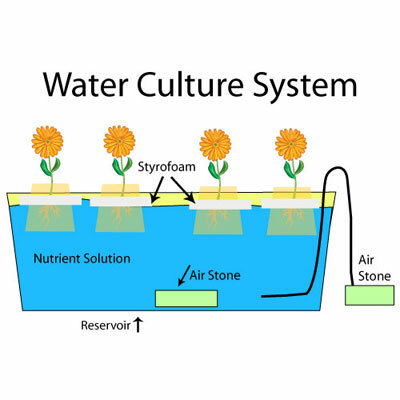 Water Culture systems are about the simplest of all six types of hydroponic systems. While technically simple, they are still very effective for growing plants hydroponiclly. Not only do a lot of home hydroponic growers really like using water culture systems, but many commercial growers use this type of system on a large scale as well. Mainly because the water culture systems is a simple and easy concept. It’s also a very inexpensive type of system to build, and another reason why it’s popular with home growers as well. Even though the concept is simple, there are plenty of imaginative ways to use and build water culture systems out of different materials. How a hydroponic Water Culture system operates is easy. The plant is actually suspended in baskets right above the nutrient solution in the reservoir. Usually by styrofoam floating on top, or through holes cut in the lid covering the reservoir. The roots hang down from baskets the plants are in, and hang down directly into the nutrient solution where they are submerged. The roots remain submerged all the time 24/7. The roots don’t suffocate because they get the air and oxygen they need from air bubbles rising through the nutrient solution, as well as from dissolved oxygen in the water itself. The more air bubbles the better for water culture systems. The bubbles rising should make the water look like water boiling at a heavy rolling boil. The bubbles should be rising up through, and making direct contact with the roots as they rise to the top of the water to be most effective for the plants. There are actually two ways of providing aeration and dissolved oxygen to the nutrient solution. An aquarium air pump and air stones are typically used to provide air bubbles to the nutrient solution for water culture systems, as well as other types of hydroponic systems. The air pump provides the air volume, and is connected to air stones with an air line/tubing. The air stones are made of a porous rock like material, the small pores create small individual air bubbles that rise to the top of the water (nutrient solution). Soaker hose can be used in place of air stones to create the air bubbles as well. The soaker hose creates even smaller air bubbles. The smaller the air bubbles, the better for aerating the nutrient solutions. Smaller air bubbles provide more contact surface with the water. The contact between the air bubbles and water helps to replace the dissolved oxygen taken up by the plants roots. Though not typical in water culture systems for home growers, surface agitation from falling water splashing around is another very good way of aerating the nutrient solution. The higher the water is falling from, and/or the more volume of water falling, the more downward force it has when it hits the waters surface. The more downward force, the deeper the agitation and more aeration (dissolved oxygen) provided. This method of aeration is more common in commercial water culture systems because they use large volumes of water compared to home growers. Another variation of the typical water culture system is a recirculating water culture system. The recirculating system works like a flood and drain system but never drains. You can have as many growing containers (water culture reservoirs) as you want connected to one central reservoir. Each growing container has its own fill line, as well as a drain/overflow tube that drains back to the central reservoir. Some growers will use buckets instead of wide shallow containers. Each bucket with their own plant in it, and of coarse filled with nutrient solution. They may have a row of these buckets. Using a fountain/pond pump to pump the nutrient solution up to each of the buckets. As the water fills the buckets, the excess water spills over into the overflow tube and flows back to the reservoir where it’s recirculated back through the system again. Most growers that recirculate the nutrient solution like this for their water culture systems only use an air pump in the central reservoir, rather than in each individual bucket (mainly to save money). They let the water pump run 24/7 all the time. However if you have air bubbles running in each bucket like a typical water culture system, you can vary the on time for the water pump. Also the plants would benefit from the direct contact with the rising air bubbles contacting the roots. Recirculating the water allows you to be able to utilize falling water as a source of aeration in the system. Also you don’t need to keep checking the water level in each container to replace the water the plants drank up (you just check and replace it in the central reservoir), a nice benefit when you are growing large, or many plants in the same system. Just about all the large commercially operated water culture systems recirculate water through the system. The term “DWC” is often used incorrectly when describing water culture systems. So what is “DWC,” and why isn’t “DWC” one of the six types of hydroponic systems? Well, that’s because it’s simply not a different type of hydroponic system at all. As you can see by the full name “Deep Water Culture,” it’s just a variation of the already existing type of hydroponic system called a water culture system. The word “Deep” in front is only used to describe some water culture systems when the water depth in the system is deeper than 8-10 inches, then it can be defined as an actual DWC system. However regardless of the water depth, DWC systems are still water culture systems. Most of the time the water/nutrient solution depth doesn’t need to be deeper than 8 inches. That’s really only needed for larger plants that have larger root systems that need more space, and/or drink up a lot more water. Or when using a container like a bucket that needs to be filled high enough to reach the plants main root ball near the top sufficiently. Plants like the size of most varieties of lettuce can easily be grown using only 4-6 inches of water in water culture systems. Now with that said, their’s no difference between how a typical water culture system and a DWC (deep water culture) system works or functions. Their exactly the same, the only difference between the two is the depth of the water in the system. Regardless of whether it’s a typical water culture system, an actual DWC system, or even a recirculating standard water culture or true DWC system, you still want to make sure you have enough water volume, and good oxygenation to the root system to support the plants. Even when they reach full size. Water volume is different than water height. If you take a gallon of water and pour it in a wide bucket, the water height may only be a inch or two high, but you pour the same gallon of water in a 3 inch wide tube, the water height will be closer to 2 feet high. So water volume and height are two completely different things. Should the water level be above or below the baskets? There’s often confusion and sometimes maybe even debate on where the water/nutrient solution level should be in water culture systems. Should the basket be touching the water, or hanging just above it? There are pros and cons for both, but there is no right or wrong, it can be either. The water level is also very quick and easy to change in a water culture system by simply adding more water, or taking some out. When the air bubbles reach the top of the water, they pop on the waters surface. When they pop they splash tiny little water droplets an inch or two above the water’s surface. How much of these tiny water droplets get splashed around depends largely on how much air is actually being supplied, and thus how many air bubbles are rising to the surface from the air stones. When the basket is not touching the water and hanging just above it, these tiny splashing water droplets help keep the growing media near the bottom of the baskets damp. How damp depends on how many air bubbles there are popping and splashing on the water’s surface near the basket. A good comparison is comparing it to boiling water (heavy rolling boil, a rolling boil, boiling, just simmering). With a heavy rolling boil being best, and just simmering being minimal. Another factor is the type of growing media that’s being used. Some growing media will absorb and hold moisture quicker and easier than others, and that will make a big difference as well. When the basket’s are touching the water, the growing media in the baskets can absorb/wick up more water than if they were hanging above it, and this can sometimes be beneficial. But here again the type of growing media is going to make a big difference because some growing media will absorb and hold moisture quicker and easier than others. Thus can become completely water logged near the bottom of the baskets if it’s in constant contact with the water. If it does, just lower the water level so the baskets are hanging above the water instead, or use a different type of growing media. It’s also important to mention that how big the plant is makes a difference as well. The plants roots will fallow the water/nutrient solution. Meaning they will go, and grow anywhere that has moisture. If the plant is small and the roots haven’t grown out the bottom of the basket yet, it may be beneficial to have the baskets touching the water. At least until the roots are growing out the bottom and long enough to remain submerged. Even when the bottom of the baskets are nice and moist from plenty of tiny water droplets splashing around by the popping air bubbles while hanging above the water. The extra moisture close to the plants main root ball from the growing media directly wicking up water/nutrient solution while the baskets are touching the water, can speed up root growth while the plants and root mass are still small. To begin with I first need to say the called Kratky method is not a new or different type of hydroponic system. I say “so called” because it’s really just variation of a standard water culture system, but has sometimes been commonly referred to by a person’s name (renaming it) instead. As far as I can tell, the variation was dubbed the Kratky Method after B.A. Kratky at the University of Hawaii who teaches non-recirculating hydroponic methods. Non recirculating hydroponic systems (also referred to as “run to waste” systems) don’t circulate water/nutrient solution from the reservoir to the plants and back again to the reservoir. They still pump water from the reservoir to the plants, but then allow the water/nutrient solution to drain off onto the ground, or into a drain system to discard any runoff. It sounds wasteful, but non recirculating systems can be very efficient and have very little runoff if done right. Water culture systems by definition are non-recirculating, but can be modified to be circulating systems as well. The hydroponic system sometimes referred to as the Kratky method is simply a water culture system without the air pump, as well as part NFT system. It’s a water culture system because the plants hang above the water/nutrient reservoir the roots hang down into. It’s also part NFT system because like NFT systems, there is a gap between the basket holding the plant and water the roots sit in. This gap is an air pocket and is supposed to replace the air pump in a standard water culture system. While the plants are small the basket is supposed to touch the water so the roots can begin growing out the bottom. As the plants grow and the roots get longer, the plant drinks up some of the water as well. That lowers the water level leaving a air gap. Without the air pump to replace the dissolved oxygen and oxygenate the water, the plant’s need the air gap to be able to get the oxygen from. This type of system design is useful in places where electricity is non existent or unreliable. However this methods does have it’s distinct drawbacks. The air pump does more than just supply dissolved oxygen in water culture systems. The rising bubbles also keep the water moving around. When the water/nutrient solution is stagnant, the mineral salts (nutrients) settle near the bottom. As a result the nutrient balance becomes uneven (very strong near the bottom, and very weak near the top). The rising air bubbles from the air pump create movement in the water that keeps the nutrient solution mixing all the time, and thus nutrients evenly distributed throughout the water as well. Also, while the plants roots are able to get oxygen when using the Kratky method, the roots above the water line cant get nutrients, and the roots below the water line cant get oxygen because they have already depleted the dissolved oxygen in the water early on, and there is nothing to replace it. That’s a source of stress for the plant. Think of it like being in swimming pool and not being able to move while having your nose above water so you could breath, and having your mouth below the water line and able to drink water so you don’t dehydrate. You can survive this way if you had to, but it would be very uncomfortable. Plants are adaptable and will always try to adapt to their environment and surroundings as best they can. But the conditions provided when using the Kratky method are far from ideal conditions. While they are far from ideal conditions, and the cost to run an air pump 24/7 and/or otherwise replace the dissolved oxygen is extremely low. In areas where the electricity is very unreliable or nonexistent, the Kratky method can be a beneficial and useful option.